Garden shredders are one piece of kit that is regularly debated in the gardening world; people love the soil fertilising mulch that one creates but it’s also constantly prompting questions about whether you should buy a garden shredder or simply rent one. Now obviously there are pros and cons to each, which I’m about to get into, but to sum up this article for those that don’t have time to read on I’ll tell you what the camp I roll with. You should buy a garden shredder as they’re a great investment. Want to read on? Here’s why. For garden shredders you can expect to pay at least £100, although you may be able to get one for a few quid cheaper. The more expensive they get, the more powerful they tend to get too, and the more unlikely it is that it’s going to get blocked all the time and it can handle thicker branches too. On the other hand you could rent one, which may cost you around £30 or so for a weekend’s worth of shredding. This is fine if you’re only using the garden shredder once, but for the regular gardener who likes to get the hedge trimmer out (or shrub trimmers if you prefer by hand) and trim shrubs and branches 2 or 3 times a year it may be worth it to invest in your own instead. Just think about it, 3 times renting a year for 5 years is going to cost you quite a bit more than just renting one outright, plus when you buy one you’re in control of when you can use it and you don’t have to run into the problem of a shop being all out of rentals when you really need to tidy your garden up that weekend. Most gardeners will also know why you should be using one in the first place, and that’s because of the lovely mulch that using one generates. 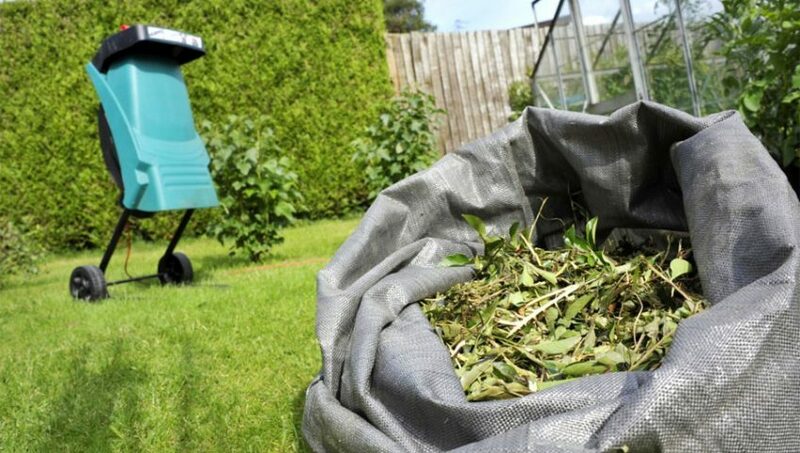 Churning all your garden waste up, such as loose twigs and branches, in a shredder means you’re actually recycling what nature provides and not just chucking it away. The mulch can be spread around your garden and helps improved soil quality by supplying it with much needed nutrients, leading to better plants in the long run. As an added bonus it also helps suppress the growth of nasty weeds, so at the end of the day you’re saving more money by not having to buy fertiliser and weed killer. Not only that, mulch really helps plants in a time of drought, which in turn helps the wildlife when there’s a shortage of water too. NOTE: Before you buy you also need to be aware about safety. Using a garden shredder is quite safe provided you know how to use it properly and you wear adequate safety gear. It’s worth taking a look at our hedge trimmer history fact sheet too. 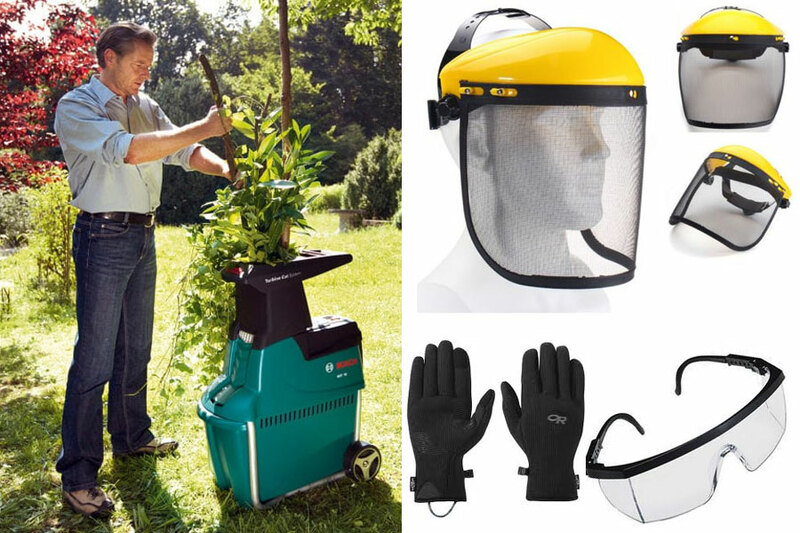 Get hold of goggles, gloves and safety clothing so you don’t get scratched before you even plug your new garden shredder in. Also, make sure you never put in anything that is obvious the blades won’t cut. Not only is it for safeties sake, but you could also damage the shredder. Finally, don’t put any wet waste into an electric shredder, for obvious reasons. So, what garden shredder should I buy? You can expect to pay around £100 for a decent high quality garden shredder that’s going to do the job efficiently and won’t end up breaking down on you before you’ve even thrown half of your garden waste in there. There are a number of brands that put out garden shredders; such as the esteemed Bosch, Black & Decker and Flymo. Generally, you can expect to pay a little more for well-known branded products but you’ll definitely be getting a worthwhile deal from it. They do amazing chain saws too if you need something to cut the branches before shredding. 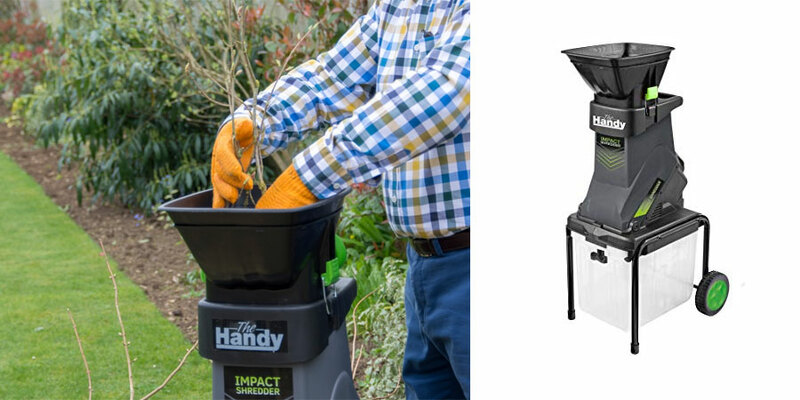 At the lower end of the scale we have the Handy Impact Garden Shredder, which you can get for around £96 excluding any delivery charges. It’s portable, meaning you can easily wheel it around the garden to have it where you need; saving you the effort of carrying bundles of branches about making more mess, all the while dropping half of it on the garden lawn(and obviously the lawn mower won’t thank you for that). The downside is the 3m cable means you may not be able to take it as far as you want, but that can be overridden by using an extension cable. It also has a powerful 2400 watt motor and will shred solid branches up to 40mm in diameter in a fast rotary shredding action, and there’s enough space in the debris bag to fit 50L of waste. It doesn’t have any of the fancy features that the more expensive models have, but this is a great bay if you’re simply after a simple basic garden shredder. This is obviously quite a bit more expensive – at around £336 – but it’s a powerful beast that is designed to shred large trees, hard branches, shrubs and other green material. It cuts up your waste incredibly fast with a turbine system that will significantly reduce the chance of blocking, but if there does happen to be a block it is equipped with an easy unblocking system. You’re not getting any more space for you waste though, as it also fits 50L in the collection box. Still, if you’re after a shredder that’s going to handle thicker waste without much trouble and not make you end up having to unblock it all the time then it’s well worth the investment. If you have a lot of money to burn then you could pump for the Makita GSP5500 Petrol Garden Shredder. At nearly £1,100 this is more for the buyer who is in the gardening business, not to mention the cost of having to fill it up with petrol too. However, for that price you get a hell of a lot of brute force; shredding 50mm branches with a 9 blade cutting system, each blade being individually detachable for sharpening. It’s safe to say that you’ll have your garden cleaned up in no time with this beast.